James "Red" Varnum (23 April 1928 – 29 March 2005) was the co-author with Jim Jacobson of the Eamon adventure The Cave of the Mind. 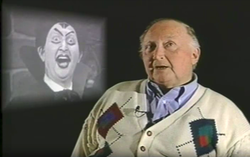 Varnum was for many years an employee of Iowa's WOI-TV where he worked as a video producer, designer, director, and writer, and featured in several locally-produced programs including The Red Dash and the cult horror movie show Gravesend Manor (as the Duke). It was also rumored that Varnum was the voice of the puppet Gregory in his wife Betty's long-running children's program The Magic Window.